Can someone point out some good tips how to determine the cause why lots of buttons don't respond on the CS. I attached a file where i marked the buttons that don't work. - Checked on the Base the resistor networks --> Replaced 1 resistor network but did not help. - Checked all cables and beeped for connection from CS to Base --> All OK. I would love to see some shematic that shows me if i push a button where the exact signal runs to. Its hard to rule out things step by step to find the cause of the problem this way. Anyone got some more tips what i can check? Can you swap some of the '595's? Are the 595's for the switches. I thought the 165's were. That means i was concentrating on the wrong IC's. 595s are for outs and 165s are for ins. Make sure that all of the diodes are the right way round. - Swapped the 595's --> No change, still the same buttons do not respond. Can't find whats causing this, more tips? Just a shot in the dark.......on the lowest three tactile switches,the right ones' diode is supposed to be the opposite way round to all the others...........nearly caught me out when I built mine. I also had issues with the mainboard to csboard connections.....might be worth checking again? Now i wonder that it maybe possible the problems are on the base board instead of the CS. Is this possible? And any other tips? but no, it was a bad solder point on the core board. First time it happened to me, the solder point looked perfectly good, even under a magnifying glass! Just continue to trace on the baseboard, until you see different behaviour to a working switch - somewhere there must be the problem. - Voltage measured not pressed arround 5.11 volt when button is pressed voltage drops to about 4.56 volt this happens to both working buttons and not working buttons. This happens at the button itself but also on connection of the 165 on the base board. Looks like everything is OK.
- I can't measure the 595's direclty because of the transistors. 595's supply the voltage needed for operation when button is pressed 165's see voltage change on a input thus meaning they get a pulse. We got 8 inputs depending on what button is pressed the 165's translate to a bit for instance: 10110110 this is sended to the PIC and then the pic responds to it by sending the correct voltage to leds and send readout to LCD and the correct information to the SID. Correct me if i'm wrong. So basicly when i send the following input 10110110 (this is OK at the CS<->165's) to the PIC it then has to send out information packages to different components (LCD,SID,595's) what if the information to the SID is obstructed could it be possible that the other information is not communicated back? Thus resulted in not working buttons, no read out to LCD and no change to the Sound generated? I'm running out of ideas on this problem. Based on the symptom set my first guess would be to take a close look at the 165 at U20 and all associated components..... an easy test for the chip would be to swap U20 with any other 165 to see if the symptoms change. I have seen wrong polarity on the R38 and R39 resistor networks cause similar issues, as well as using 5 pin resistor networks -and- leaving out R57/R58 (these are pull ups for the RC and SC serial lines on the shift register chain). So everything besides these buttons works as expected? 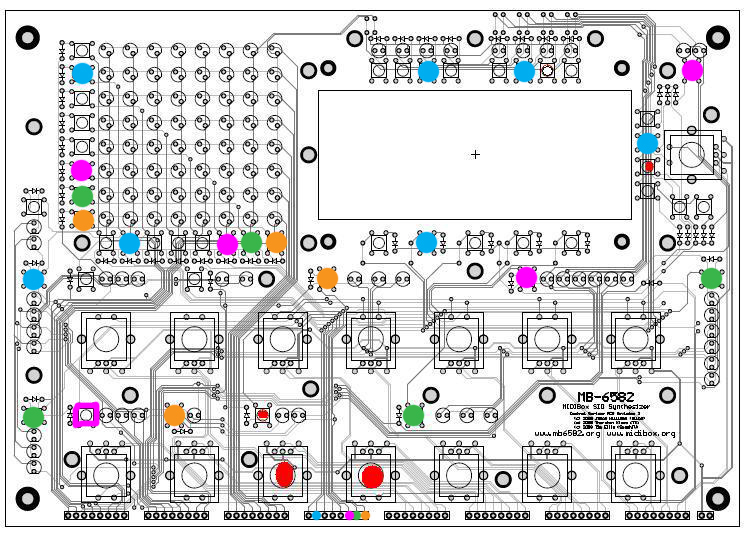 There is a wiring diagram in the wiki pages, scroll down to "Control Surface Wiring" and note the errors in my diagram (was too lazy to fix this at the time, sorry). Measuring voltages is probably hard to do because the switches are in a 8x8 matrix, so the voltage at the 75HC165 input is going to be either 5V for unpressed switches or ~1V for pressed switches, but only for 1 ms in every 8ms (guessing at the actual duration, could be 0.5ms every 4ms. It's 1/8 duty cycle though). It doesn't explain some of the faulty switches, they must be a separate issue. I can't be certain but if you think the LEDs and the other switches are working, then the "current sinks" for the LED and switch matrices must be OK.
@wiba: Attached 2 pictures how i measured. I followed the buttons wiba marked blue. I only measured for connection (beep, or no beep) for now. Measured as close as possible on the button on one side and on the other side on the connection of the input of the 165 on JD5. This is in the not pressed state i hear beep. Then i pressed in the switch and measured the other pins of the switch and also beep is heard. :shocked: This is repeated for all the buttons you marked blue. All beep the same. @smashtv: I allready swapped the 165's and nothing changes. you mentioned the r57 r58 these are only needed when you have 5 pin resistor network right? I use 6 pins resistor network. How can i best measure the resistor network? Cause it should be 10k but probally due to bad measuring i sometimes measure 20k. Except the buttons i mentioned it works great, not tried the all LED application though. but thats worries for later first i want these switches to work. @smashtv: I allready swapped the 165's and nothing changes. you mentioned the r57 r58 these are only needed when you have 5 pin resistor network right? Correct. The 165 inputs only use 8 pull up resistors per chip, leaving two spare resistors when using 6 pin networks. Since 6 pin networks are often easier to find, adding an extra pad so they can fit maximizes compatibility with available parts. 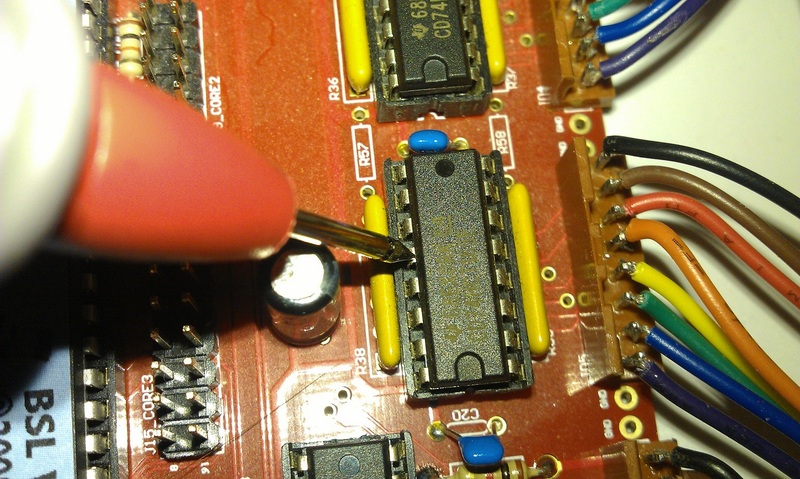 Using the spare resistor in the array for the SC/RC serial line pull up is a convenient bonus. I use 6 pins resistor network. How can i best measure the resistor network? Cause it should be 10k but probally due to bad measuring i sometimes measure 20k. 6582 (and all past MIDIbox designs) require the 'common' type. 'isolated' will not work.... Is there any chance yours are the wrong type? hmm. How can i recognize this. The resistor network has SIL in its name. Could mean isolated. I did some measurements. Measured pin 1+2 = 10k measured pin 3+4 = 20k. But when i measure pin 1+3 = 10k also pin 1+4 = 10k also pin 1+5 = 10k and 1+6 = 10k. So could the resistor network be fault? It seems to be a common resistor network, if you compare your measurements with TimÂ´s picture, so it looks ok. 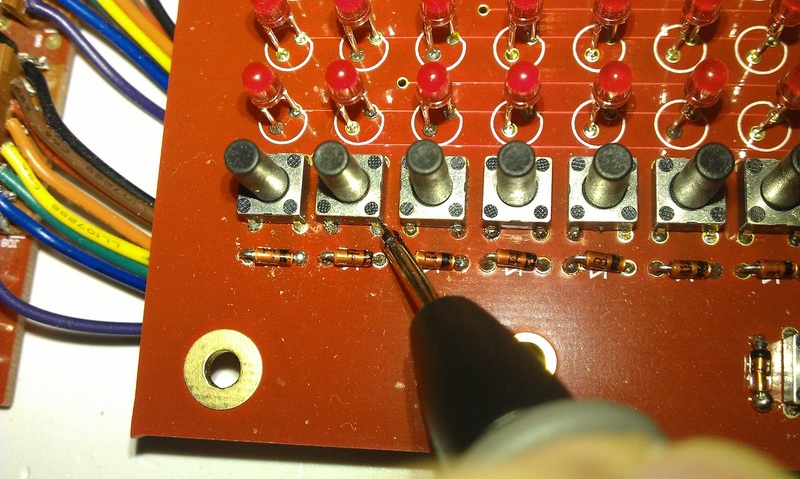 The common pin of the resistor network should be in the square pad on the board. It may be worth checking in case you have not done it already. So i checked common pin of the resistor network, and the orientation is OK.
You may have continuity along all the pads connecting the switches with "blue dots" - this just means your soldering is good and the switches all work. The issue can still be a short between ANY pad along those tracks and something else. Perhaps you should desolder the wires going into JD1-JD5 and use a wire to touch pins on JD5 and pins on JD8 at the same time, to simulate switch presses. Observe which ones work or not while MB-SID is running. This might be tedious and boring but you must discover somehow whether the problems are on the CS PCB or on the base PCB. 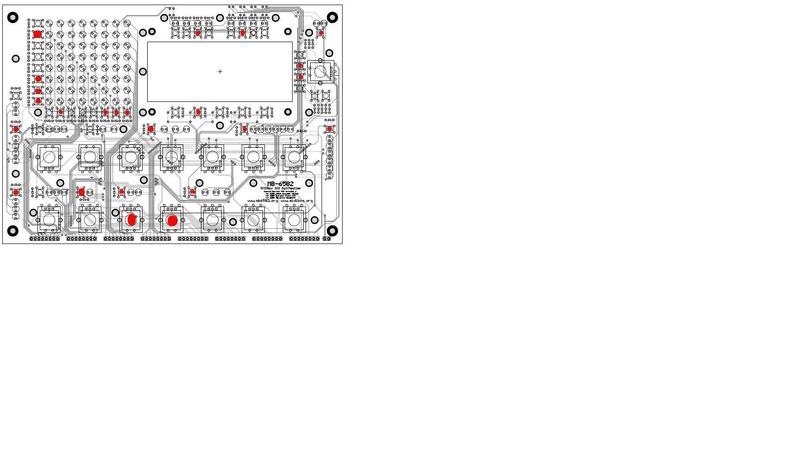 Or at least know for sure that the base PCB and the 74HC165 are all working as expected. Perhaps it's easier to desolder the wires from the CS PCB first, and have them poke out the bottom, so you can test them while the case is closed... i.e. you probably still want the LEDs to work so you can see the effects of simulating button presses. You could perhaps download some of the other troubleshooting apps (or simple apps) that use DIN modules and test just the inputs of the 74HC165... those apps will not use a switch matrix so you should bridge pins/pads to ground, not to the pins of JD8. I had the problem a couple of times that the IC sockets are broken. There was no connection between IC and board and after (destroying,) desoldering and replacing the IC socket the error was solved. Measure connection from IC to joint at PCB. This shouldn't happen but it obviously does.